It’s a few days before Thanksgiving, and you’re sitting in front of the TV for a family movie night. You’re enjoying some buttery popcorn, and the worst happens. You bite down on an unpopped kernel, and you break a tooth. Before you go into a panic, you should know about dental crowns! At Times Square Dental, we can fix your tooth with a dental crown so you can face the upcoming Thanksgiving holiday with a healthy, fully functioning smile. Let’s look at some of the ways crowns can fix your smile in our Boise, ID dental office! Dental Crowns Restore Your Smile! When you think about all the things that could possibly go wrong with your smile, tooth loss is at the very top of the list. It has a domino effect, quite a devastating one, for your smile and your health. Basically, tooth loss can lead to jawbone deterioration and bone mass, which leads to more missing teeth. So, any time you lose a tooth as an adult, it’s important to replace as soon as possible. Another reason to replace it right away is so you can eat! That’s why a knocked out tooth around Thanksgiving can put a real damper on your holiday experience! A great way to replace a tooth is with a dental bridge. This is where a lifelike dental crown fills the empty space as a replacement and two crowns secure it over the adjoining teeth on either side. A smile with a big empty gap can be unsightly and embarrassing, which will have you avoiding the camera when everyone wants to take family photos on Thanksgiving. An empty space in your mouth will also make chewing more difficult, which is another reason a dental bridge can save your Thanksgiving! Dental Crowns Make Your Smile Complete! In order for your smile to look its best and function properly, it has to be complete. You need a full set of upper and lower teeth if you want your smile to look good and you want to eat without pain or discomfort. Removable dentures work for some people, but others might prefer a stronger option. There is no stronger, more durable tooth replacement than dental implant restorations! These are dental implants that are placed inside the jawbone. They’re capped with dental crowns that match the look of your remaining teeth for a natural, lifelike smile. Dental Crowns Make Your Smile Look Great! How many Thanksgiving dinners have you enjoyed over your lifetime? Can you believe your teeth have withstood all those feeding frenzies? But we don’t use our teeth only one day a year. We need them every single day, practically all day long, year after year. That is no small feat! It’s a good thing they’re made to handle it. Sometimes, however, your teeth can collapse under the pressure! The fact is, your teeth aren’t immune to being damaged. That can mean a chipped or cracked tooth, or stains, dents, or dings. A natural-looking dental crown can cover those small imperfections. Without the protection of a dental crown, the damage on the tooth’s enamel can open the door for bacteria to get in and threaten your oral health. Dental Crowns Make Your Smile Healthy! Most people have probably had a cavity at some point in their life. And in most of those cases, a standard filling was the best remedy. That’s because cavities are usually pretty small. They’re holes caused by tooth decay that are cleaned and filled so your tooth is safe from more decay. Dental fillings are effective because they are bonded to your enamel that hasn’t been decayed, which helps them keep your teeth strong. But in some cases, a cavity can be too big for a filling. This means you don’t have enough healthy enamel left to bond with the filling securely. At times like this, you need a dental crown! A dental crown covers the whole tooth so it’s sealed tightly against decay. It also strengthens the tooth so you can chew comfortably! Make Sure Your Teeth Are Ready! There’s no better excuse to head to the dentist and fix your teeth than Thanksgiving. Dental crowns can repair a multitude of problems that would otherwise have you missing out on an enjoyable, pain-free feast. 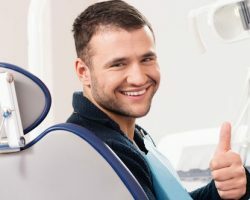 Along with the eating experience, dental crowns can get your smile healthy and beautiful again so you can pose for family photos with confidence. Fix your teeth for Thanksgiving with dental crowns! Call Times Square Dental in Boise, ID today at 208-278-1069 fill out our convenient online form to schedule an appointment.